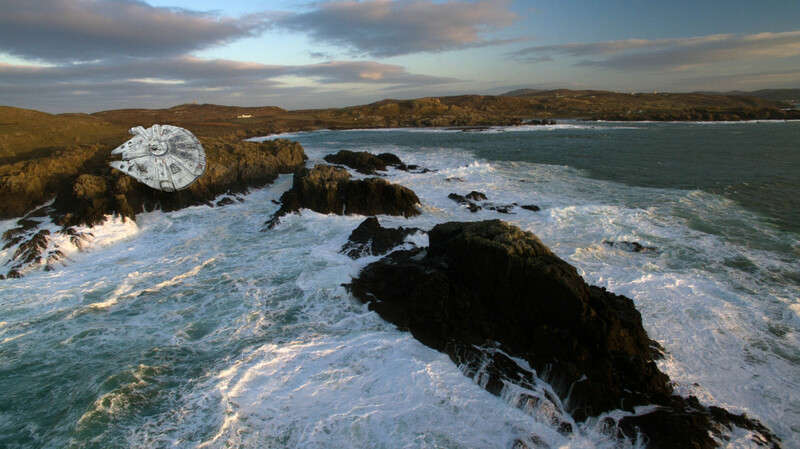 Leaving from Malin Head, Ireland's northernmost point, Bren Whelan's walking tour takes you to the landing site of the Millennium Falcon on Luke Skywalker's island, a rocky outcrop sticking out of the vast ocean of the water planet Ahch-To. The tower in the distance marks the meeting point for the tour. It's Ireland's northernmost building on the mainland, built in 1805 by the British to provide a lookout against a Napoleonic invasion. The actual walking part of the tour starts near a gate that leads onto a vast private property adjacent to the wild Atlantic coast. Very few people have access to this location, which is another reason why Bren is the person to talk to if you're a fan. Bren actually worked on set as part of the health and safety crew, providing personal assistance to Mark Hamill and Daisey Ridley. The Millennium Falcon set was constructed by local builders. Bren can tell you many stories around the actual filming while taking you to the exact spots where the scenes were shot. Being an experienced outdoor educator, he also has an extensive knowledge of the area's flora, fauna and history. The standard tour takes between 3.5 to 5 hours and involves a (fairly easy) 3.5 kilometre walk. The Millennium Falcon has long since left the planet but the location is still worth exploring. Bren Whelan is an award winning photographer and climbing guide based at Ireland’s most Northerly Point, Malin Head, Donegal. After many years of travelling around the world he now finds his adventure fix along the beautiful Wild Atlantic Way, where he operates the adventure tourism business Donegal Climbing. Having worked on the recent Star Wars movie The Last Jedi as a personal safety assistant for Mark Hamill and Daisy Ridley, Bren now provides an insightful and authentic behind-the scenes-tour of the Malin Head location. Bren at the local crew screening of The Last Jedi in December 2017. The starting point of the tour is at Lloyd's Signal Tower, Malin Head. Stefan explored the site in November 2017. After we met at the lookout tower, Bren drove us to the boundary of the property where we began walking down towards the Atlantic. It was slightly drizzling, but I suppose that's to be expected on a water planet. A gravel road led us to the site where the base camp was set up. It always amazes me how much effort goes into making a blockbuster on location. In this case, the crew had to park the trucks for the gear in a swamp, literally. The actual site of the Millennium Falcon model was another two hundred metres from here, overlooking the rocky shoreline. From here, we walked along the cliffs to the most scenic point of the tour which recently featured in National Geographic Traveller UK. I admit that my costume and prop could be improved, but the location was pretty incredible! In order to book this tour, get in touch with Bren via his website. Farren's Bar, the country's northernmost pub, which was paid a surprise visit by Mark Hamill. McGrory's, a family-run hotel, popular restaurant and legendary music venue where the cast and crew celebrated their wrap party.